Diamond has always been an outstanding and desirable material. With the invention of synthetic growth techniques at high pressures and temperatures in the fifties, it became technical material, especially for mechanical applications. However, it was the advent of low pressure deposition techniques that made accessible the excellent mechanical, thermal, optical and electronic properties. With these chemical vapour deposition (CVD) techniques diamond became available in the form of extended thin films and free-standing plates or windows. Doping during deposition could be realized, making diamond a p-type semiconductor. With CVD-diamond a wealth of new applications opened up. The fundamental problem of diamond synthesis is the allotropic nature of carbon. Under ordinary conditions graphite, not diamond, is the thermodynamically stable crystalline phase of carbon. Hence, the main requirement of diamond CVD is to deposit carbon and simultaneously suppress the formation of graphitic sp2-bonds. This can be realized by establishing high concentrations of non-diamond carbon etchants such as atomic hydrogen. Usually, those conditions are achieved by admixing large amounts of hydrogen to the process gas and by activating the gas either thermally or by a plasma. Hence, a common feature of all diamond CVD techniques is a gas-phase nonequilibrium, i.e. a high supersaturation of atomic hydrogen and of various hydrocarbon radicals. Typical deposition conditions are: 1 % methane in hydrogen as source gas, 700-1000°C deposition temperature and gas pressures in the range 30-300 Torr. The various diamond CVD techniques differ mainly in the way of gas phase activation and dissociation. The most common techniques are microwave plasma assisted CVD and thermally assisted CVD, usually realized by gas activation with a hot filament, Each of these techniques has its pros and cons. The distinguishing features are the deposition rate, the deposition area and the quality of the deposited diamond. The maximum growth rate reported so far amounts to almost 1 mm/h. However, those high growth rates are usually limited to very small deposition areas (« 1 cm2). In general there is an inverse relationship between film quality and growth rate. 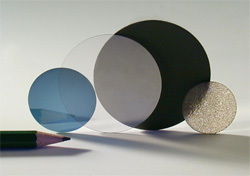 Optically transparent films with high thermal conductivities are usually deposited at rates not exceeding 10 µm/h, regardless of the deposition technique. The excellent optical properties of diamond have been known for a long time. However, optical applications require extended discs or thin coatings not provided by natural diamond crystals. With the development of CVD techniques the situation has changed completely.